Each year over 15,000 fires associated with clothes dryers occur, with injury and property damage resulting in 84 million dollars. We strongly recommended every property utilizing clothes dryers, partake in dryer vent maintenance. 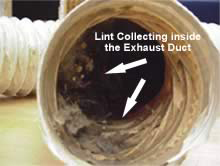 Whether it's obstructions in the exhuast ducting or improper routing of the venting, lint can get caught in the system. • A buildup of lint could cause serious risks when left undetected. • Lint is highly flammable, and poses a fire risk. • Improper airflow as a result of lint build up affects dryer performance, resulting in a possible breakdown of the unit. • Birds, bug infestations and other pests sometimes like to reside in a warm dryer vent exhaust, resulting in further airflow obstructions. • Long exhaust runs with many bends, will have more lint build up. • Telltale signs of restricted airflow within the exhaust ducting include incomplete clothes drying at normal cycles, and/or extreme dryer temperatures. 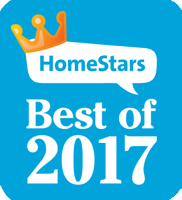 Most of these issues can be resolved with proper dryer vent maintenance. Your system will run clean, resulting in drying time and energy reduction, as well as the prevention of dryer damage and fire hazards. Ozone Duct Cleaning provides thourough cleaning of your dryer vent system.